SafetyRoll is a motorised Rollup Station that attaches to the aluminium battens on the PowerPlastics Solid Safety Cover, used to effortlessly roll the cover in or out. It is suited to PowerPlastics Solid Safety Covers measuring up to 6 metres wide. SafetyRoll ensures the cover is not dragged over the paving, avoiding abrasive wear and tear on the PVC. Provides a protective storage solution to prolong the lifespan of the cover. The retractable wheel axis is slotted into the aluminium battens of the PowerPlastics Solid Safety Cover using adjustable straps. 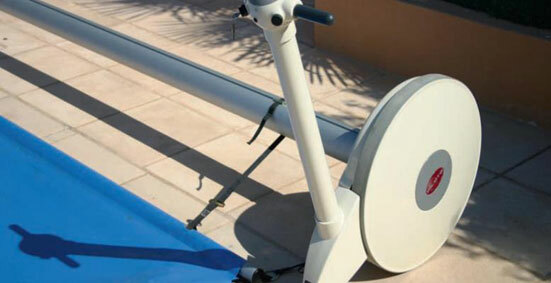 After engaging the power using the key and on/off dial, the user then ‘drives’ the unit down the length of the pool, supporting the wheel’s axis at the handles as the gear motor rotates the shaft, effortlessly covering or uncovering the pool. Battery: operates off a built-in 12V battery which is recharged from the mains. The charger is included. The entire unit can be easily moved after use should you wish the pool surrounds to be clear. SafetyRoll has a six week delivery time. One year (12 months), subject to adherence of the suggested guidelines for care and maintenance.